Since Apple previewed iOS 8 yesterday during the keynote at WWDC, we’ve been continually trying out the new iPhone and iPad software to get familiar with the changes coming to users this fall. First up is a new way for apps to be promoted on the iPhone using subtle location-based prompts. Similar to how the lock screen features an icon and a swipe up gesture from the lower right corner of the display to quickly access the Camera app, several users are reporting a variety of apps are being featured on the lower left corner prompted by being near a relevant venue. For instance, in the screen shot displayed above on the left, the user is visiting an Apple Store and an App Store icon appears in the lower left corner. Swiping up from the bottom acts as a shortcut to quickly access the Apple Store app within the App Store. 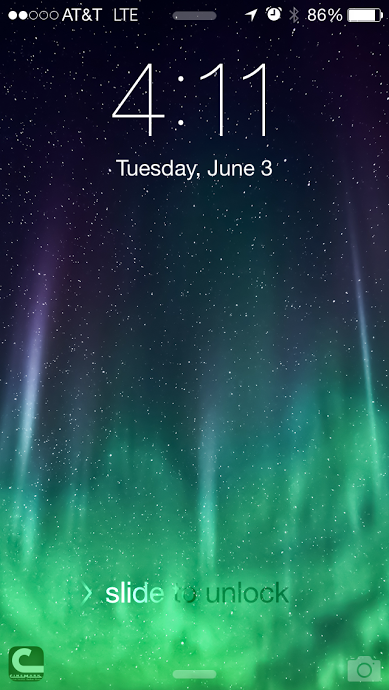 Once installed, the Apple Store app icon then appears on the lock screen when visiting the retailer. While it’s not certain which specific perimeters must be met for this functionality to work, the commonality between other supported App Store apps including Starbucks and ShopSavvy is location. Other apps such as Cinemark (see on the right) have also been noted as appearing on the lock screen this way. It’s likely that this is simply the new way iOS displays Passbook and other location-aware notifications, rather than as a banner on the lock screen. Another interesting feature of this is when the app shortcut is available on the lock screen, a separate card persistently appears in the multitasking view for further access. Perhaps most important to note is that none of the compatible apps have required updating through the App Store to deliver support signaling the use of existing features to implement this particular iOS 8 feature. Next on the list of notable changes in the iOS 8 beta preview is the lack of support for Apple’s iPhoto image editing software. While some but not all of its featured are now found in the stock Photos app, it seems Apple has intentionally disabled support for iPhoto for iOS at least during the initial iOS 8 beta period. When prompted to launch, the system displays the dialog box shown above stating that editing and sorting has moved to the Photos app. The Photos app does not, however, match feature parity with iPhoto for iOS so it would be surprising to see it not regain support for iOS 8 before lunch albeit possible with upcoming changes to how photos are managed as we’ve already covered. While it doesn’t say much about the fate of iPhoto for iOS going forward, Apple does list the lack of support on iOS 8 beta as a known issue: “iPhoto for iOS will not launch on iOS 8 Beta. Launching Photos.app will migrate your iPhoto edits to the iOS 8 Photo Library. Make sure your iPhoto for iOS data is included in your device backup.” A new Photos app for Mac was previewed yesterday at WWDC and set to be released in 2015. Aside from the addition of powerful editing features in the stock Photos app, a number of organizational changes are present as well. For instance, Recently Added has replaced the Camera Roll. A separate Recently Deleted album is also present, although it only lists certain deleted images and videos rather than acting as a persistent trash can of sorts. Lastly, it appears Apple has disabled the ability to leave reviews for apps on the App Store while using the iOS 8 beta. Assuming this is a change only during the beta period and not a more telling sign of what’s to come with iOS 8, this is likely a feature and not a bug as several apps break while iOS previews are still in beta and result is undue critical reviews. iOS 8 will be available in the fall giving Apple time to work out the rough edges and developers time to guarantee compatibility with the software. U: It looks the the app shortcuts on the lock screen falls under the umbrella of Apps Near Me and Continuity, which is a major feature in iOS 8, as seen below.